I'd been to Little India in Singapore and Malaysia. Both offered a fascinating experience. Of course I'd been to India just recently and now I'm wondering, exactly what part of India are they talking about? India is so diverse! 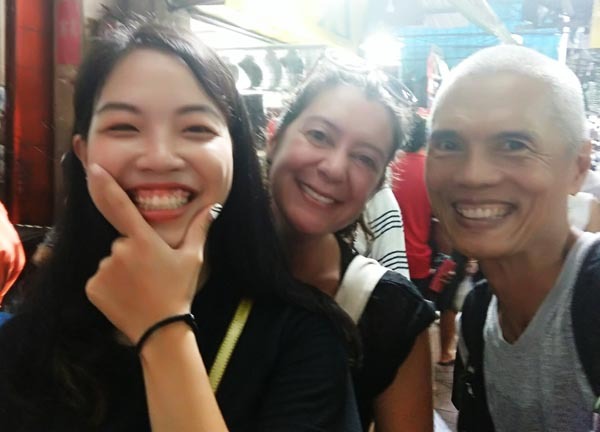 With Rinna Pow of 'Get Lost in BKK and Beyond's free walking tour, I was about to find out. 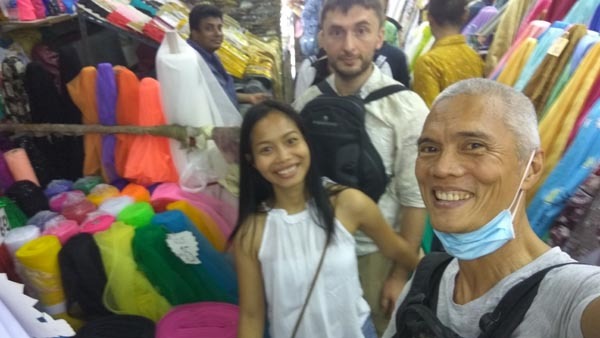 Stumbling upon Rinna and her tours from CouchSurfing was a pleasant surprise. In any place, I could get an instant community through social groups like this. The people share the same thinking and the vibe is usually agreeable and pleasant - this group was no exception. We all met at Hua Lamphong MRT and got ourselves acquainted while waiting for the others. Because it was a big group of ~20 (combined with CouchSurfing and Rinna's FB friends), Rinna grouped us into small groups of 4 - which was more manageable specially with cab rides. Little India wasn't too far away. This is supposed to be the oldest Indian restaurant in Bangkok. It was clean, presentable and nothing pretentious. We took the long table and placed our individual orders. Since everything on the menu had chili, lunch for me was buttered Naan bread...sigh! 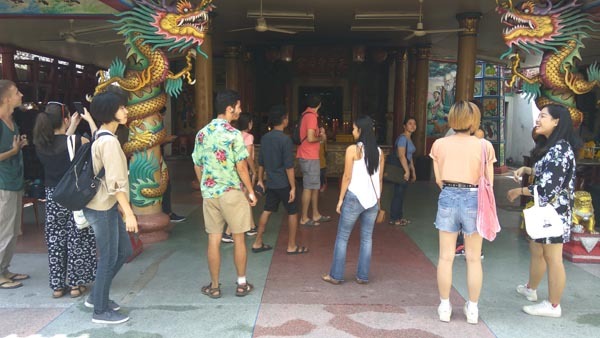 First stop was a Chinese temple. Chinatown and Little India are adjacent to each other near the banks of the Chao Phraya River. The walk took us along side streets selling Indian wares, spices and garment. I stopped for a masala spice - good with ca phe phin masala sua da! Later, we went to the Indian Phahurat Market. The corridors were narrow and it was pretty crowded. No one was in a rush and we inched our way with the human traffic flow. It has a lot of everything - more spices, more fabrics, deities, spices, clothing, etc. With all the congestion, slow-moving human traffic, heat and the crampy feel, it got a little overwhelming. I didn't really realize the walking tour would extend into the night with dinner at a Chinese restaurant and evening drinks at the roof-top bar of Wallflowers. Abruptly, I had to leave to catch my 4pm screening of a Bangladesh movie at River City Bangkok. 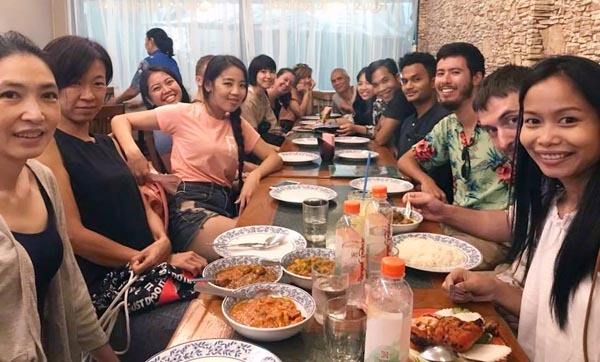 The tour was a refreshing departure from the usual offerings of Bangkok. But as a lone traveler, the highlight for me was meeting new friends - and I did, some of whom I've messaged with already. I would like to applaud Rinna Pow for organizing this free tour, and also for organizing it professionally with attention to the minutest detail. She placed the restaurant reservation, updated us on tour status, put up a CouchSurfing link with set itineraries and posted pictures on Facebook. Other participants also posted their video. Just by catching-up on events posted at Get Lost in BKK and Beyond, you can fill the week with things to do and places to see. Rinna, thanks again for that wonderful tour!